Focus on Firewood …when is enough more than you need? 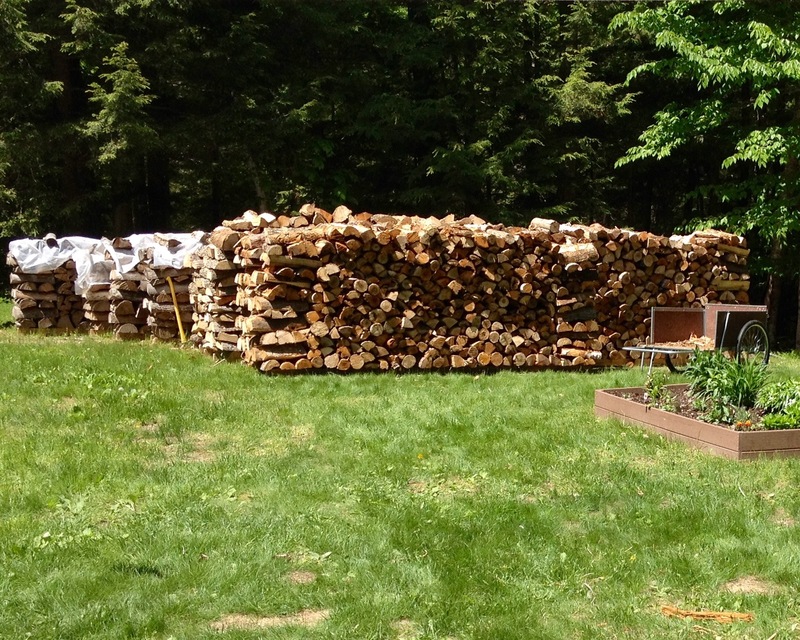 Nearly nine cords of firewood “season” in the back yard …enough to last for the next three Maine winters. Spring is in the air and May has not yet yielded to June. The days are pleasant enough for us to throw open all the windows during the day (and even overnight) to let the fresh air into the house to clear out the mustiness of being closed up tight for so many months. Although there is a something special and unique about all the four distinct seasons here in the New England, it is undoubtedly true that winters in Maine can be quite cold. The arrival of spring with it’s warming temperatures is a most welcome change of season. But that change also signals the need to accomplish a whole set of chores that have been unnecessary and so largely ignored during the cold, snow and mud of wintertide. For my husband, one of the first things on the spring to do list is the ordering, delivery, and stacking of firewood. Because we heat our log home primarily with the heat produced by our Jotul wood stove, we need to have a good supply of dry, seasoned firewood to burn each winter. When we lived in Southern California, we had a fireplace, but it was more to provide atmosphere than any real warming of our ranch style home. We had forced air heat system for that. The wood we used in California came through a number of sources, scraps from pruning the fruit trees, old construction lumber, the end cuts from a local pole company and even some we cut in the local forests and split ourselves. It was rare that we had more than several cubic feet available at any one time. It was definitely a case of opportunistic acquisition of fuel rather than the calculated and methodical procurement that has become a spring ritual here in Maine. When we first moved into our log cabin in Maine, it had only a small, unvented propane stove off the kitchen. Almost an afterthought by the original builder and certainly not something that could be counted on to provide any real comfort in the dead of winter. He and his family instead relied on a propane powered base board heating system. It didn’t take us long to realize that changing this would be one our first major projects after we settled in. Don spent hours on the internet learning all he could about thermal efficiency, stoves, and firewood. We hired a contractor to build a massive split field stone hearth and chimney that could accommodate a wood stove capable of providing us a reliable heat source throughout the cold winter months. With the stove installed our next task was to locate a good firewood guy, which turned out to be harder than one would think in a state where trees far outnumber it’s citizens. We started out buying two cords of wood at a time, but quickly learned that what some of the suppliers considered “seasoned” was actually “green”, cut only a few months prior to delivery and containing too much moisture to burn efficiently if at all. So we bought an additional two cords of this green wood, stacked it and let it sit until the following winter when most of the moisture had evaporated. It did indeed burn much easier and give off much more heat. It has been a learning process and we now buy four cords of green wood each spring. In the seven years we have been using our wood stove, we have gone through numerous firewood guys (some did not deliver a true measure of wood, some dumped diseased, insect infested or dirty wood, some are no longer in business, and sadly, when we finally found a really good guy, he died far too young). But we are not giving up. We like the look and feel of having a fire in the house all winter. With nine cords of wood stacked up in the back yard and another half cord in the garage we definitely have enough, but is it too much? It’s a good problem to have. This entry was tagged firewood, green wood, heating your home, Jotul, Maine, seasoned firewood, wood stove. Bookmark the permalink.